I'm heading into hospital for an operation on my neck later today and recuperation may take a while. Hence this blog is not going to be updated for quite a few weeks. Operation was a success - now got a titanium disc in my neck and I've regained sense of touch in feet and hands. I can now walk again without the help of a walking stick. I'm keeping my keyboarding/desk activity to absolute minimum. Need to do a whole load of exercises to get neck more mobile and my immune system is working overtime which makes me really physically tired. ..which simply dumps out the interrupt information every second. Another way is to use itop, which has the benefit that it outputs the interrupt rate which is lacking from my rune above. Unfortunately itop does truncate the interrupt names, but I'm not so worried about this - I generally want to see very quickly if a machine is suffering from interrupt saturation or is missing interrupts, which I can get from itop easily. And to run for a number of iterations, run with the -n flag, e.g. It's based on a very small sample (even though we get thousands of hits a month), so I'd hate to draw many conclusions from the votes. However, it looks like audio is giving a lot of users grief and this needs fixing. Making Suspend/Resume better does not surprise me as I see a lot of weird ACPI and driver suspend/resume issues on the hardware I work with. It's interesting to see that faster boot times are low on the wish list, but I does not surprise me that video and wifi support are higher priority (since they need to work!) compared to getting to boot faster. And to finish with, not many users think Linux does not need improving - this spurs us on to get subsystems fixed to make it rock! Ľubomír Rintel has written a detailed and very helpful debugging guide for grub2. The guide covers how to debug with gdb using emulators such as QEMU and Bochs as well as traditional serial line debugging using a null-modem. The tricky part is to be able to pull in the debug and symbol files for dynamically loaded modules, however this has been solved by Ľubomír with a gdb and perl script. The guide gives some useful tricks which can be used not just with grub2 but other boot loaders too. It's well worth a look just to learn some useful gdb hacks. A little while ago I blogged about the Chumby, a fine little ARM+Linux based internet device made by Chumby Industries. Well, now they have gone one step futher and produced the Chumby One (see right), which currently retails for $99 for pre-orders. This new version comes with some extra features compared to the original: an FM radio, support for a rechargeable lithium ion battery an easier to use volume dial. There is a great blog article about design rationale behind this new product on Bunnies Blog including a video of the production line and some photos of the motherboard. I'm quite a fan of the Chumby Classic, but it's great to see a far more affordable little brother being added to the product range! I wish Chumby Industries every success with the Chumby One. Firstly, I recommend removing KVM as this has caused me some grief catching breakpoints. This means QEMU will run slower, but I want to remove any kind of grief I can to simplify my debugging environment. ..and start the boot process.. The past few days I've been tinkering with the TianoCore EFI and trying to get Ubuntu Karmic to boot with the EFI enabled grub2. To make debugging easier, I did all this inside a virtualised QEMU environment. A lot of this earlier hackery was blogged about in a previous article. In trying to get this to work I hit a couple of issues; figuring out workarounds took some thought and time. Some of it is still "work in progress", but at least now I know what needs to be fixed. First you see the TianoCore EFI starting and then loading grub2 - this then loads a very slimmed down grub.cfg and eventually boots the system. I hit several issues; firstly the kernel oops'd when trying to call virt_efi_get_next_variable() - for some reason calling this EFI runtime service support function in the EFI is causing the kernel to oops. Other EFI support functions seem to work correctly, so my current belief is that the bug is not in the kernel EFI driver, but this needs a little more poking around to verify this assumption. Second issue is that loading some grub2 modules and using some fundamental grub2 commands such as 'set' cause the EFI get caught in a loop. It took me a while to corner this - eventually I cut down the default grub config file down to a really minimal version which could at least boot the kernel! Anyhow, this grub2 issue is first on my list of bugs to fix. Debugging these issues is a little tricky, but using QEMU helps as I can dump out debug from grub2 over a pseudo serial port which I can capture and view in real-time. Secondly, debugging the kernel using a serial console in QEMU (using the console=ttyS0 boot option) allows me to capture all kernel boot messages (including the offending kernel oops). I still need to look into ACPI support and how to get the video initialised to get more than bog-standard VGA resolution, but these are currently lower priorities. Without QEMU and Tristan Gingold's port of the TianoCore EFI to QEMU, this work would have been much harder. A few weeks ago I wrote about my experience using an HP Mini netbook - well in this follow up article describes how I reduced the power consumption on this device with some fairly basic steps. Then I unplugged the power and let powertop run for 10 minutes to settle in and then noted that ACPI power estimate was ~13.0W. My first saving was to totally disable Bluetooth - wireless power savings are a good way of saving power. I don't use Bluetooth at all and to save memory from the driver being loaded I blacklisted the btusb module by adding btusb to /etc/modprobe.d/blacklist.conf (this is rather a heavy handed approach!). I then rebooted and re-measured the power consumption - down to 9.7W. My next tweak was to enable laptop mode. To do this, edit /etc/default/acpi-support and set ENABLE_LAPTOP_MODE=true. Not sure if this is a big win for devices with SSD like my netbook, I believe one will see a bigger power saving with HDD based devices using this setting. I noted that powertop was informing me to use usbcore.autosuspend=1 and disable hal polling, so I'd thought I'd follow it's wisdom and make these tweaks. I edited /etc/default/grub and changed the GRUB_CMDLINE_LINUX_DEFAULT setting by adding usbcore.autosuspend=1, and then ran sudo update-grub to update /boot/grub/grub.cfg. ..for some reason /dev/sdb was being polled and I don't require this overhead for some auto sensing functionality. I rebooted and remeasured the power consumption - down to 8.7W. Not bad. Next I totally disabled compiz and turned my display brightness down - this saved 0.3W, bringing the the system down to a reasonable 8.4W. I'm not sure if the compiz savings were much, but if I can save the GPU work by turning off compositing then that must save some power. So now my machine was in a usable state, and down to 8.4W. I could tweak my access point to reduce the number of beacon intervals to save Wifi wakeups, but that's going a little too far, even for me! I then wondered much power Wifi was using, so I disabled it and after 15 minutes my system dropped down to 7.3W. This is good to know but a little pointless for my normal work pattern when I need net access - it is a netbook after all! I'm sure I can save a little more power, but for now it's a good win for a little amount of work. I'm open to any suggestions on how to save more power. Please let me know! Yesterday I got poking around a perplexing audio recording issue; quite bizarrely stereo (2 channel) audio from the internal microphone would record perfectly, but mono (1 channel) would not. After working my way down through the driver and though ALSA I got to the point where I could not see how there could be any driver problem, so the issue had to be with the ALSA user space library, or the hardware (or both!). My colleague spotted an interesting characteristic - using alsamixer to set the capture level to 100% left channel and 0% right channel or vice-versa made the mono recording work. Further investigation by using stereo recording of a pure sine wave (whistling into the microphone!) showed that the left channel was the complete reverse of the right channel. Then the penny dropped - the mono recording was essentially ALSA summing left and right channels, causing a near perfect zero recording since the left channel was the inverse of the right channel. Doh. Urgh. Well, at least there is some kind of ALSA workaround. So the moral of the story is to twiddle with left and right channel levels and do some stereo recording and look at the results before hacking through the driver. I should have applied Occams' razor - I assumed the complex part (the driver) was the problem. Earlier this week I blogged about QEMU and EFI BIOS. Trying to debug a problem with grub2-efi-ia32 has given me a few little headaches but I'm finding ways to work around them all. The first issue is getting a system installed with an EFI BIOS. My quick hack was to create a 4GB QEMU qcow2 disk image and then inside this create a small EFI FAT12 boot partition using fdisk - (partition type 0xef in the 1st primary partition). I then installed Ubuntu Karmic Desktop with ext4 and swap in primary partitions 2 and 3 by booting with the conventional BIOS. I then installed grub2-efi-ia32 in the EFI boot partition and then booted QEMU using the TianoCore EFI BIOS that has been ported to QEMU. One problem is that the EFI BIOS does not scroll the screen, hence all output when it reaches the end of the screen just keeps over writing the last line, making debugging with printf() style prints nearly impossible. Then I found that the BIOS emits characters over a serial port, which QEMU can emulate. Unfortunately, the output contains VT control characters to do cursor positioning and pretty console colours, which makes reading the output a little painful. So I hacked up a simple tool to take the output from QEMU and strip out the VT control chars to make the text easier to read. ..and this dumps the output from the BIOS and grub2 to stdout in a more readable form. The parse-output tool is a little hacky - but does the job. For reference, I've put it in my debug repository here. The perf tool by Ingo Molnar allows one to do some deep performance using Linux performance counters. It covers a broad range of performance monitoring at the hardware level and software level. In this blog posting I just want to give you a taste of some of the ways to use this powerful tool. 3) ..and build the tool.. There is plenty of documentation on this tool in the tools/perf/Documentation directory and I recommend reading this to get a full appreciation of what the tool can do and how to drive it. ./perf report --sort comm,dso,symbol | grep -v "0.00%"
..showing us where most of the CPU time is being consumed, down to the function names in the kernel, application and shared libraries. Without the debug info in the object code, just the annotated assember is displayed. This is one powerful too! I recommend reading the documentation and trying it out for yourself on a 2.6.31 kernel. 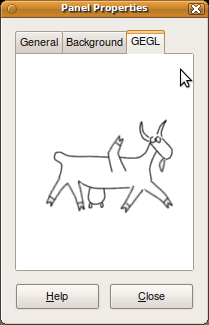 ..if you are wondering, the 5 legged goat is the GEGL mascot as created by George Lebl. Weird. I've been poking around with the Extensible Firmware Interface (EFI) and discovered that Tristan Gingold has kindly ported an EFI BIOS from the TianoCore project to QEMU. The EFI tarball at the QEMU website contains an EFI BIOS image and a bootable linux image that uses the elilo boot loader. I simply grabbed the tarball, unpacked it and moved the EFI bios.bin to /usr/share/qemu/bios-efi.bin to make sure I don't get confused between BIOS filenames. So if you want to get to play with EFI, here's a great virtualized playground for one to experiment with. Kudos to TianoCore, Tristan Gingold and QEMU! (or use gconf-editor to do this if you want to use a GUI based tool). I suspect the rationale behind the 60 second confirmation delay is just in case one selects logout, restart or shutdown accidentally and in doing so, one has the ability to cancel this before accidentally closing one's session. So beware if you use this tweak - it assumes you really want to instantly logout, restart or shutdown!